Erum, your cards are absolutely gorgeous! I would be so honored to receive one in the mail. I love your use of the Golden Garden images behind some of the more "showy" flower sets. Perfect! Lots of great inspiration! I particularly like the Merry card for a unique use of the Peony Bouquet to make a lovely Christmas card. It's a good reminder that you don't always need "Christmas" stamps. Wishing you a Happy New Year! They are all artistic and so beautiful, Erum! I really love your classy cardmaking style!! Wishing you a happy New Year!!! Your cards are absolutely amazing. Those colors just pop!!! Thanks for sharing your favorites with us. every one of your cards is gorgeous, Erum! Your cards are stunning! Thanks for the inspiration and for the opportunity to win! Beautiful! Thank you for sharing them.. I love your cards! So very pretty! I love Altenew too! Your cards are beautiful. I especially love the Christmas cards. I love your style of card design. All very beautiful. love the beautiful flowers and distressed backgrounds; thanx for the inspiration and blog candy opp! No possible way to choose my favorite. BEAUTIFUL! 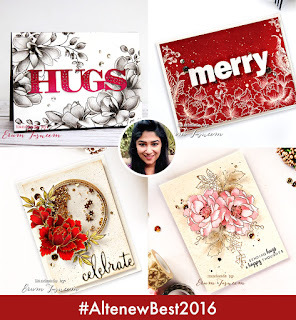 You've designed incredibly gorgeous cards this year; how wonderful to see some of your favorites reviewed. Those featuring Beautiful Day and Peony Bouquet: works of art! Spending time at your blog has been a highlight for me in 2016; looking forward to more visits and inspiration in 2017. Receiving a card from you would be marvelous! Framing guaranteed! I am new to your blog. You are an amazing artist! Thanks for all your gorgeous Altenew cards! All cards are just Fabulous!! OMG your cards are beautiful. Exquisite is the word that comes to mind. I think I would frame your card, rather than send it if I won. Thank you. Your style is so lovely. I am glad I found you! I will follow you. I appreciate your talent. You're amazing card made with the Beautiful Day set is gorgeous. Thank you for sharing. Oh my, they're all beautiful, but the red and white one is exquisite! Love all your cards, beautiful work! I especially like the sending hugs and happy thoughts. The pink and gold on the pale pink is wonderful! Thanks for sharing! OH,OH, OH! I totally loved your 'red' cards! I didn't recognize your name, but instantly recognized the cards. I have started saving images of card ideas I want to try, and the white on red and the red with gold heat embossing are both stunning! I am totally wishing l had started making cards before I was 64!! So many things to try, I need to live to be 200! Thanks for being a part of my inspiration. 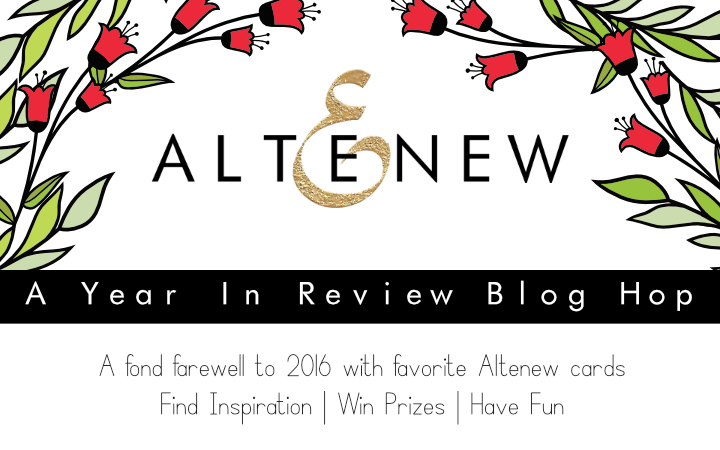 Love your work; a review of the year's posts is a great idea for a blog hop! So beautiful! Love your card designs. Such beautiful cards. I wish I had your talent. This is an amazing group of cards that showcases Altenew's floral images magnificently! All of these cards are absolutely gorgeous! I especially love the red flower shaker card is my favorite although I also love the soft pink flower with the Beauriful Day stamp set. Your colour choices and composition are so good. Your cards are beautiful. Glad I discovered your blog. Oh Erum, I don't know why you seem surprised to be included in this group of designers! Your work is AMAZING! I WANT that red MERRY card! LOL Absolutely GORGEOUS! These are absolutely amazing! Wow! I would be honoured to receive one of your cards. Oh my goodness! Each one of these cards is just stunning! Beautiful creations! Gorgeous cards. I particularly love the shaker card. Most shaker cards are cutesy but this shows you can make an elegant one too. Beautiful projects! I'm so loving that pretty shaker card. Thanks for the inspiration! Beautiful technique = beautiful cards. I am new to card making and can only hope I will learn to create such beautiful cards throughout my journey. Thank you for the inspiration! Happy New Year. I fully understand why you are in this bloghop! That would be a sweet treat to have one of your personal cards !! Each one is so stunning and beautifully crafted ! Wow! Your cards are awesome! I'm definitely becoming a follower of you! Gorgeous! Such beautiful cards, I can't pick a favorite, they all have something special!! I like be your style! Your cards are beautiful. I can tell you like be what you do! Your cards are gorgeous. I have used several of these this year for inspiration. Thanks for sharing your beautiful cards. I have used several this year for inspiration. You work wonders with Altenew flowers. My favorites of the year were definitely that B/W magnolia beauty and the red shaker at Christmastime. Love seeing all this beauty in one post. 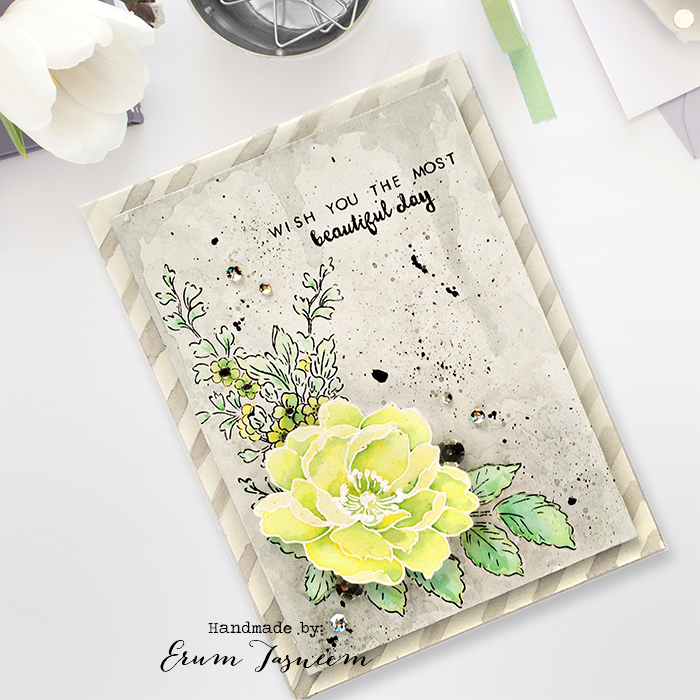 I had no doubt you would be a beautiful part of this blog hop as your cards are always such stunning creations! Your cards are works of art. WOW! All of your cards are lovely! I especially love the Celebrate shaker card and the first one, "You are awesome"! Spectacular!! TFS! I just love the diversity of your cards. Each is GORGEOUS and filled with incredible details! Thanks for sharing your artistry! Wow...so many stunning and beautiful cards. Your cards are so colorful! Thanks for sharing. Love these cards! Especially that Merry card. omg...these are stunning!! I soooo loveyour style. Your cards are all beautiful! Thanks for sharing. Love, love love your cards and the beautiful colors you've used! The flowers are stunning and it's hard to pick a favorite--they are all wonderful. Thanks for sharing on this great blog hop!! Lovely variety of cards-such beautiful style! Your cards are stunning and beautiful! These cards are all so beautiful. I especially love the black and white card. Your cards are beautiful, love how they r bright and dimensional. Wow, your cards are absolutely stunning, each one I saw I said "this is my favorite" until I went to the next one! I enjoyed seeing your beautiful creations, TFS! These cards are so lovely! I especially like the red one. Love your style! Your cards are wonderful! each card is more beautiful than the last.Altenew stamps are all so gorgeous. Gorgeous cards Erum. I think I have all of them saved and pined. I love the coloring and layering on all of them.... so, so pretty! Happy New Year! They take my breath away!!!!! Your flowers are so beautiful!!! Thank you for all of the inspiration. I hope 2017 brings you lots of joy and happiness. I love your coloring technic ! All your cards are really awesome. Erum you have created so many amazing works of art! The red and gold is still one my faves Since you posted it on Instagram but they are all amazing. You are the bouquet queen!! Wel deserved to be featured on the hop - absolutely stunning - happy 2017!! So many beautifully inspiring cards for 2106! Great cards! Thanks so much for sharing with us and for participating in this great hop and giveaway. Oh, Erum! Your work is just stunning and I would think that EVERY card you make would be your fave! Love them all! I love all these totally amazing cards! The colors are stunning & the designs are all wonderful! So inspiring! Pretty pretty cards, love your floral card designs! How gorgeous your florals are! Amazing shading. Thank you, Elum. I love your use of Magnolias for Her and Golden Gardens from Altnew. The use of shaded flowers and then pops of color are very stunning. Gorgeous cards. They are so inspirational! And so caseable! Wow!So many different ideas!Tons of inspiration!thank you! Your cards are every bit as stunning as the other cards in the hop. Thanks and happy new year! Oh my goodness! Such beautiful cards! I need to break out my Peony Bouwuet set! These are all so beautiful! What great inspiration! All your cards are really awesome. Absolutely stunning! Why haven't I haven't I been following you for years?! Your cards are beautiful. I especially like the Beautiful Day cards. Wow your cards are absolutely beautiful!! The blues are amazing!! Happy New Year!! There is such variety in your cards! I esp love the color combination in your Hugs cards. So many fantastic cards, I particularly love the magnolia one. Stunning cards! I love each one - your talent is amazing. I am also now following you on Bloglovin'. Would love to own one of your cards. WOW! Your cards are amazing! I had only seen the Christmas cards before, and now I'm in love with your florals. The pink one is especially lovely. Beautiful cards. I think my favorite is the red and gold peony card, just gorgeous! These cards are all amazing! I simply cannot pick a favorite, your coloring is just stunning! Simply amazing. What incredible cards. Sweet cards!! Seeing some of the cards on this hop make me look at some stamp sets differently. I think I will have to do some shopping :) Thanks for sharing. Every one of these is gorgeous! I especially LOVE the red Christmas card! It is so nice to see cards from so many people. I love these blog hops for that reason. I have always found something new that I hadn't seen before. Of all your cards, I really don't have a favorite. I like them all. Your MERRY card was very nice. I just love your style, so many gorgeous creations! Such great inspiration!!! This is the first time I view your card creations and I must say I am VERY impressed. So unique and different....love them! Erum, I absolutely love all of these! I recognize them all. Throughout the year I have saved each and every one of them on Pinterest, Instagram, or both! Your work with Altenew products is magical. I love how you utilize a pop of color on many of your cards. It makes the beautiful flower images the star. Thank you for sharing your talent with us. Your cards are gorgeous and stunning, I love your work and thank you for inspiring us with your talent. Your cards are absolutely beautiful! The first two are favourites of mine from earlier in the year. You have a lovely style & I look forward to more fantastic Altenew inspiration from you! fantastic coloring and card designs! What a gorgeous collection of cards :) Stunning designs!! Thanks for sharing. They are so elegant and each one is a work of art. Love all your cards and I really like the blue hibiscus flowers. Thanks for the inspiration. I am looking forward to what you bring us next year. Have a Happy New Year. Looking at all your beautiful cards gives me ideas to start my new year card crafting! Thank you for sharing your talent. Amazing cards. I can't decide which one I like the most. Thanks for the inspiration. Amazing cards. I can't decide which one I love the most. Thanks for the inspiration. Elegance personified is what I need to call your cards. Love them & I could keep looking at them. Oh the blue flowers are incredible!!! Your cards are so beautiful! My favorite is the pink flowers by Beautiful Day. Your HUGS card is stunning! Love your hugs card! Thanks for the inspiration! LOVE, LOVE, LOVE your hugs cards! All are beautiful! Such gorgeous cards, Erun. I couldn't pick a favorite; they are all beautifully done! Beautiful collection of cards! So many inspirational ideas. Thank you! Love your cards. You're work is beautiful. The way you used the peony stamp for your Merry card is brilliant. What a good way to stretch your stamps. I just discovered Altenew stamps this year and I am in love with them. I like how the layering stamps look so real. I am in love with your cards! Your style is unique and yet very distinctive. After viewing your cards I will subscribe to your blog and then get into my craft room to see what I can create. So much pretty in one post. The first card looks almost looks like a Escher drawing in that the blue pops up from the black and white. All of these cards are. Eautiful! As always I can't just choose one. I love all. If I was to win I would want them all... how can I just pick one??? Beautiful variety of floral cards. Your cards are just stunning! You do beautiful work. Beautiful cards. Your flowers are so very lovely. Such Beautiful Cards Erum! Have always admired your amazing work! So much of creativity! Wow, all beautiful cards !!! Love the black and white a lot ! Absolutely beautiful cards - thank you so much! Your talent is amazing! I love the card with no coloring. Really makes a bold impression. Really love me the black & gray card with a POP of color. Your cards are gorgeous, but that chartreuse green/yellow Beautiful day one is just WOW! Beautiful cards! You use flowers so well in many ways. Greatly inspired by your designs. All of these are absolutely stunning! So glad to have found your blog! Your cards are stunning and I especially love the hugs card. Absolutely gorgeous cards and I especially like the hugs card. I will totally make a red and white peony card just like your Christmas card Erum - that is gorgeous!!! Beautiful cards! Love your shading and coloring. Thanks for sharing! 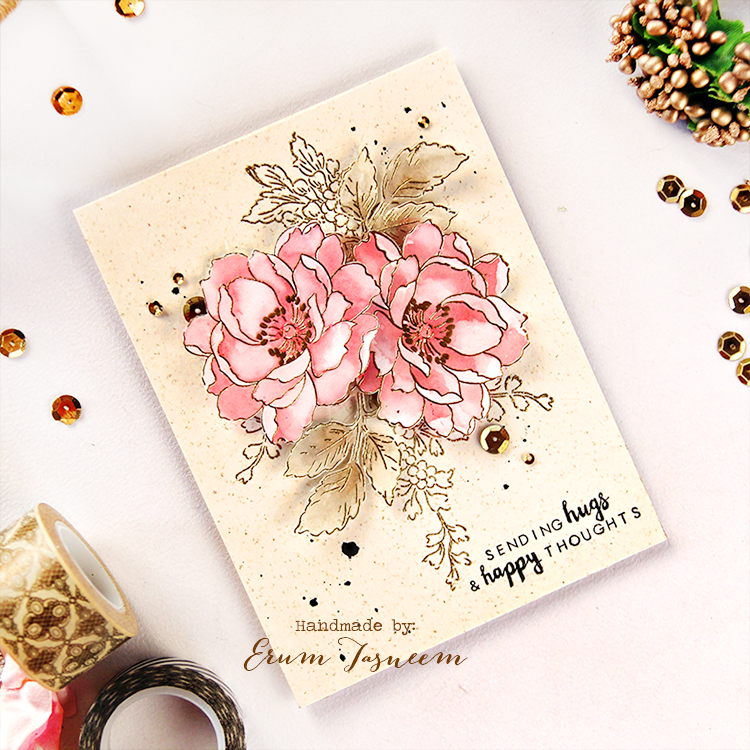 Absolutely stunning cards, and your use of peony stamp for Christmas card is so creative :) Thanks for inspiration! I like all of your cards & really enjoy shaker cards. Your black and white cards with one accent color are stunning. WOW! What an awesome job you did on all your cards. All your cards are gorgeous with rich, beautiful color!!! Gorgeous cards! 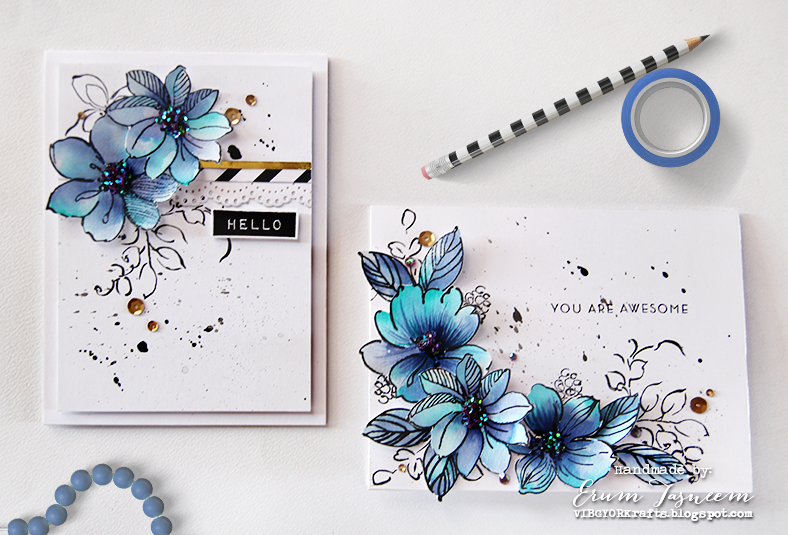 I especially love the first one with the beautiful blue blooms and the glittery centers! Your cards are simply gorgeous! I love the 3 dimensional quality of your images whether they're cut out or just colored with just the right shadows. You are truly an artist! Your designs are spectacular. Love the colors and arrangement of the elements. What stunning cards! I love your backgrounds! 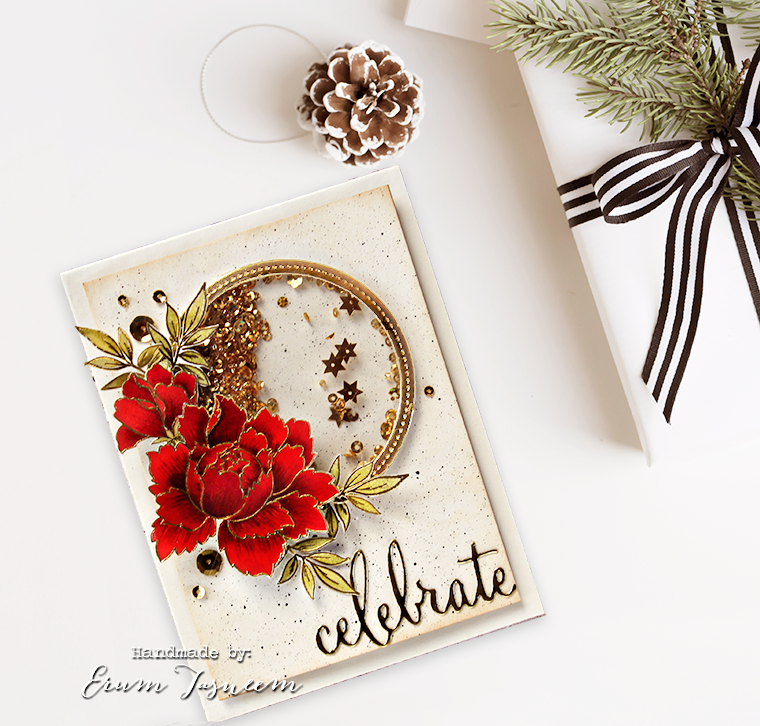 The Celebrate card with the intense red flower and gold frame was the inspiration for me to purchase the stamp set! Thanks for the inspiration! This is the first time I've come to you blog and I am stunned by your beautiful cards! Erum, your cards are all s beautiful. Love the fun effects you have used. You are amazingly talented,, lady! I dont know how anyone could choose a favorite from these, but I'd be thrilled to receive any of them! Wow, what a stunning gallery of cards! Love them all! 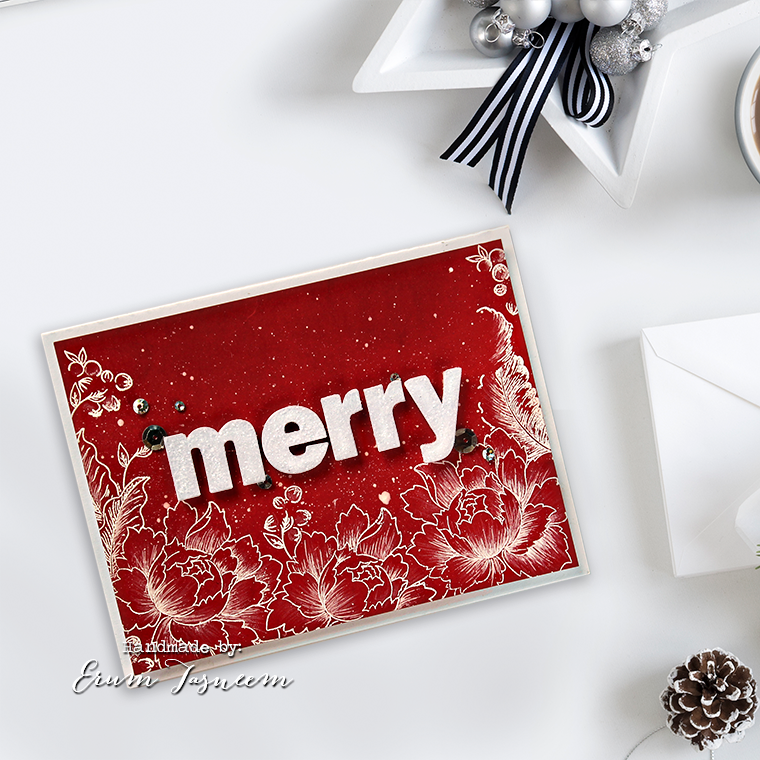 Especially inspired by the white embossed on red for a Christmas card! Wow, your cards are absolutely stunning! The shaker cards are especially gorgeous and so sophisticated. Your cards are simply gorgeous! Your coloring is amazing - especially on the first card. Those blues and the design are perfect! Gorgeous cards. I like the colors you chose for each card. So many amazing cards. Thanks for sharing them with us. So many amazing cards. Thank you for sharing them with us. 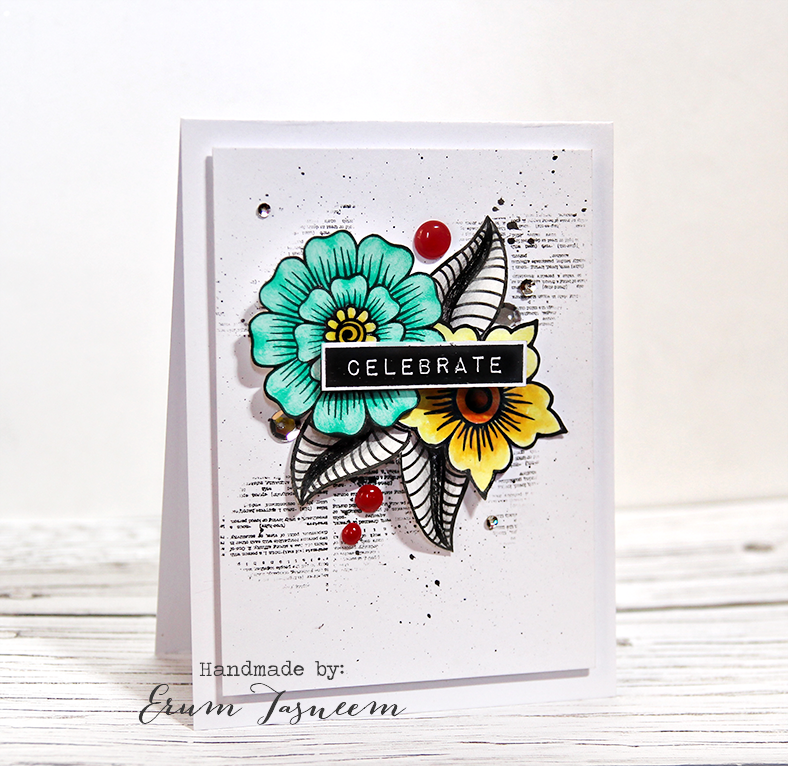 Your cards are gorgeous and I am glad to see you are using my favorite stamp set - Peony Bouquet. Erum! I LOVE all your cards and your artistic style! I am an instagram follower of yours too! Thanks for the inspiration!! WOW! Your cards are lovely. Thank you for sharing such beautiful designs. You seem to have a signature look that is fabulous. Best wishes for 2017. Gorgeous cards. Love your use of color so many beautiful pieces of art. 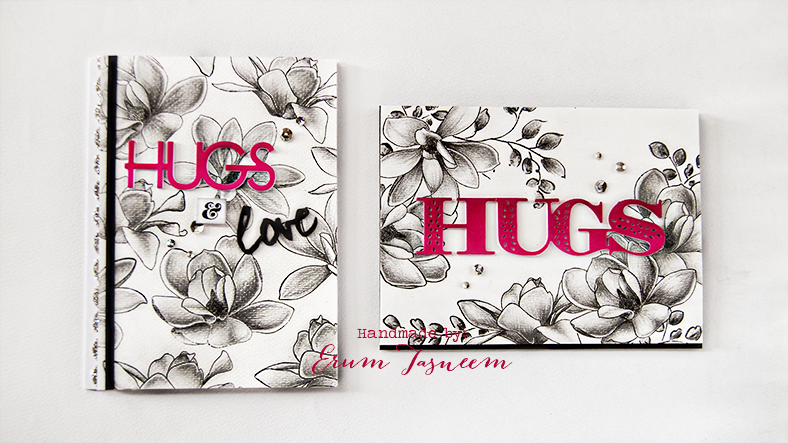 I especially love the hugs card so pretty! I'm so glad I got to see your cards! so lovely! The high card looks like something someone else did on the hop. A black and white movie this is partially colorized. I want to try this technique so bad. The celebrate card has my favorite color in it, yellow and you get extra points for using it. My dad used to have a label maker. He probably still does somewhere. I love those stamps. I love you're Sending Hugs card and those pretty pink flowers. I am jealous of you're coloring. It's so pretty. I know you embossed the Merry card. The red background with the white flowers is so pretty. I want to try it! Thanks for the inspiration. I love shaker cards but have not made one just yet. I have to be the only one in the whole world who hasn't made a shaker card. I need to find out how to make one so I can. I know my friends will love shaker cards and once I make one I my never make another kind of card again. Last but certainly not least is that pretty yellow/green flower card. I love how you variegated the leaves on this card and again used sequins. I LOVE your cards, Erum! They are all so bright and gorgeous! I love the flowers, the bold text, the shakers--each one is beautiful! Bright and juicy colors cards!!! 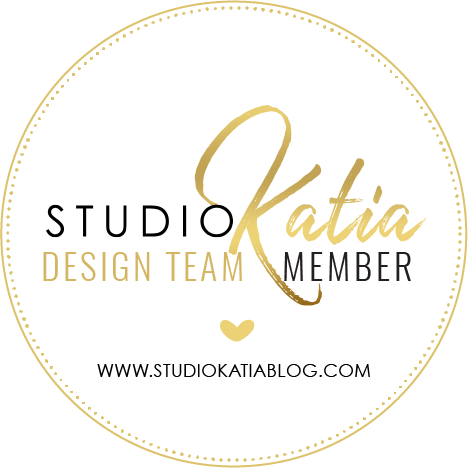 I am definitely lucky to have come across your blog as all your designs are breath takingly beautiful! I especially love the red peony shaker card, can't wait to CASE it! Have an inspirational 2017!